I have been thinking about doing this for a long time. Actually, my oldest son’s Mother’s Morning Out teacher gave me this recipe when he was about 18 months old. He is 9.5 years old now so you can see the idea has been kicking around in the back of my head for a little while! We had lots of fun and it got out their creative energy and eventually got them out from underfoot so that I could make the promised blueberry muffins! Mix up the dry ingredients in a medium sauce pan. 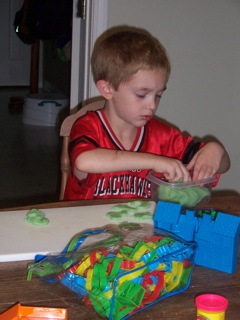 Add the oil, water and food coloring. Cook over medium heat stirring constantly because the mixture will thicken up quickly. In 2-3 minutes you should have a big ball. 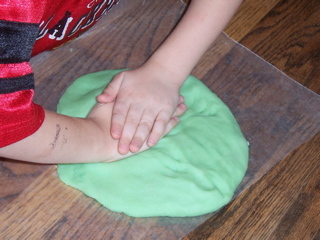 Turn out onto waxed paper or a plastic plate or board and knead until smooth and cool. (This part is great for the kids!) Store in an air tight container or freezer bag. Yes, someone got bored and took her dress off while she was waiting! Help your child learn about counting with this fun Mother Goose rhyme. 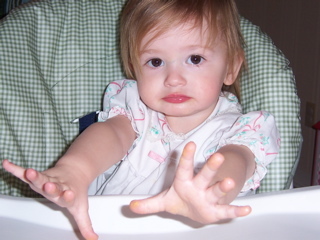 You can help your child hold up fingers at the proper times. You can get out some toy horses or even cut out some approximations of horses yourself! Maybe your drawing skills are not up to snuff but magazines and the internet are full of photos. Can you make a clip-clop sound with your hands on different parts of your body? Can you make the sound with just your tongue? Can you move the toy horse around the room at a gallop and a trot? Can your feet move like a horse? Even the littlest babies love to play this game. My kids would still be playing if I could still lift the big ones! Lift your little one up slowly over head. Use your voice to slide up as well. Do the same on the way down. Don’t pass up the opportunity in both directions for a peck on the cheek and an “I love you!” This is also a great time to work on the signs for UP and DOWN. 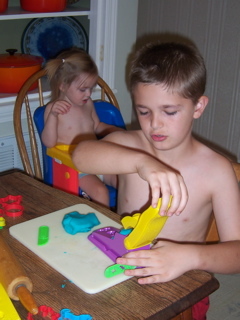 Your baby/ child is learning trust as well as up and down in a great multi-sensory fashion.